Kamala Khan has been really fun. If you haven’t read “Ms. Marvel” yet, the first trade paperback is out now! G. Willow Wilson created this fun, down-to-earth character who is a person of color and who is a normal teen who plays video games and loves the Avengers. Apparently Dan Slott loves Kamala, too. Seeing Kamala and Spider-Man team up in Amazing Spider-Man #7 and #8 was like two generations of awkward teen heroes coming together. Spider-Man and Ms. Marvel are fighting Dr. Minerva, a Kree scientist who is snatching up Inhumans still in their cocoons after being activated by the Terrigen Mists. Giuseppe Camuncoli draws a terrifying Dr. Minerva that looks like a rabid Wendigo. One thing I really like about Dan Slott and Christos Gage’s writing is that they treat Silk like an equally valid character, not just a sidekick to Peter’s story. Silk gives herself a new outfit after her boss at The Fact Channel calls her existing outfit “so tacky, right?” I wasn’t expecting Silk to be such a prominent character in Spidey’s series. Her solo series debuts in February 2015! 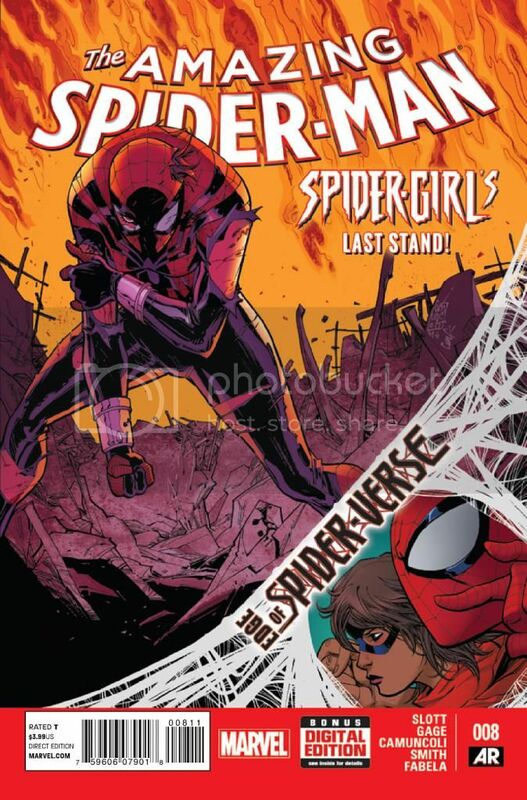 Amazing Spider-Man #8 also has a backup story starring Mayday Parker, the Spider-Girl in another universe, Earth-982. I’ve never read her before, but I like her attitude. She watches a character named Daemos attack her boyfriend Wes, and then her dad, Peter. Mayday’s mom, Mary Jane, clutches baby Ben and watches in horror as Peter bravely tries to hold off Daemos. This was an unexpectedly emotional and tonally different backup story from the lighthearted main story. I like Dan Slott’s narration told from Mayday’s perspective. She does sound like a teen girl who blames herself and feels torn between listening to her mom and doing the brave thing. Can Mayday please be a major character in Spider-Verse?